Like an ageing incandescent lightbulb, OPEC's meeting on Thursday will produce a lot of heat and shed little light. At least it won't freeze. 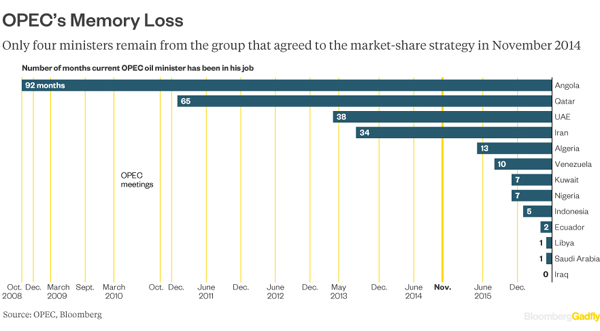 Saudi Arabia will see little reason to change direction from the policy introduced in Nov. 2014. The kingdom set the group on a path of protecting market share in the face of rapidly rising U.S. shale oil production by refusing to agree to a lowering of its output target, and now the market is correcting itself through dwindling non-OPEC supply. But the squeeze on some producers is starting to strangle -- low oil prices have lasted much longer than anybody expected and calls from within the group for action to be taken to push them higher have become louder and the battle-lines are getting deeper. The divisions within the group seem to be worsening. Prospects of an output freeze that looked to many like a sure bet just a month ago have evaporated completely as prices have risen and both Iran and Saudi Arabia have hardened their positions, while there's little chance of the group reinstating an output target that it abandoned it at its previous meeting . 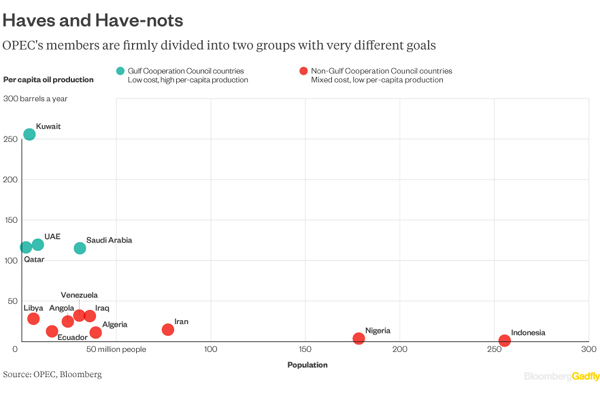 On one side are the nations of the Arabian Peninsula, with their small populations and low production costs, on the other are the rest. Chief among these is Venezuela, which has now burnt through more than a third of its gold reserves to raise the cash it needs now that oil prices have sunk. Algeria hasn't been able to revive production and is now running its first current-account deficit in a decade. Calls from these quarters for action to boost prices will fall on deaf ears. 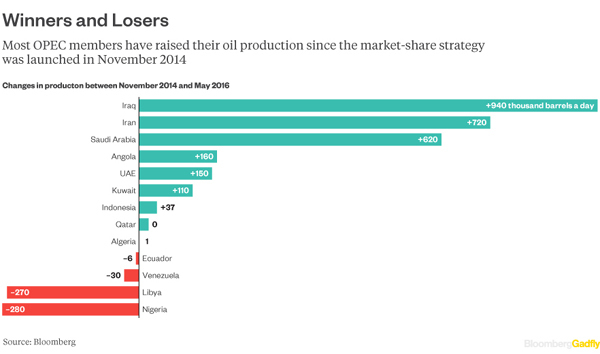 Saudi Arabia's position on the best course of action for OPEC has not changed. With oil prices back near $50 a barrel it has even less reason than at previous meetings to consider changing a policy that seems to be successfully reigning in higher-cost rivals. The Saudi view survived a change in oil minister, and the kingdom isn't the only member presenting a new face at the table. That will feed into the tone of discussions. Personnel moves at the top of several delegations may mean that ministers will carry less historical baggage into this meeting, making it easier to bridge the chasm between them. But what's more likely is that the large number of new oil ministers, with little experience of working together and few personal bonds, will find it more difficult to reach common ground. There are now just 4 out of the 13 ministers who were involved in the 2014 discussions that led to the adoption of the current strategy. 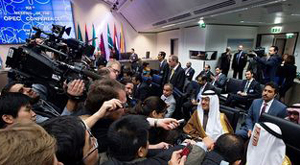 OPEC's decisions are reached by consensus, so it is always easier to keep the current policy than to change it. Inertia, therefore, is likely to reign this time around at the Vienna meeting. There's another agenda item, that's already proving to be just as divisive. Members need to select a new Secretary General to replace Abdallah al-Badri, who is due to step down in July after several extensions to his term of office. It is a role that requires real diplomatic skill. A good secretary general can help to facilitate dialogue between the different factions without being seen to take sides. Ministers have been unable to agree on a successor -- they apparently debated this issue for three hours at their last meeting without reaching a consensus. Support seems to be gathering behind Nigeria's Mohammed Barkindo, who was Acting Secretary General in 2006 and is backed by both Saudi Arabia and Iran, but it is not yet unanimous. Indonesia is fielding its own candidate, Mahendra Siregar, while Venezuela is said to have proposed Ali Rodriguez, who held the post from 2001 to 2002. We can only hope that the emergence of three new candidates will allow them finally to make a choice. Just don't expect it to be easy. Editor's Note: This commentary was originally published by Bloomberg on May 30, 2016. Petroleumworld reprint this article in the interest of our readers.